In Targetprocess it is possible to estimate Effort per Role. Say you may enter 8 h for Developer and 2 h for QA Engineer. Most predefined reports just summarize these values. However you can build advanced reports showing distribution of effort by roles as well. Let's create a basic sample dataset for our future reports. We'll create two user stories and specify effort per role. 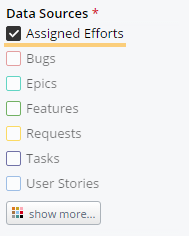 Both user stories are displayed in the board view. Using Customize Cards it is possible to display total Effort on them. There is no unit for role effort available by default. 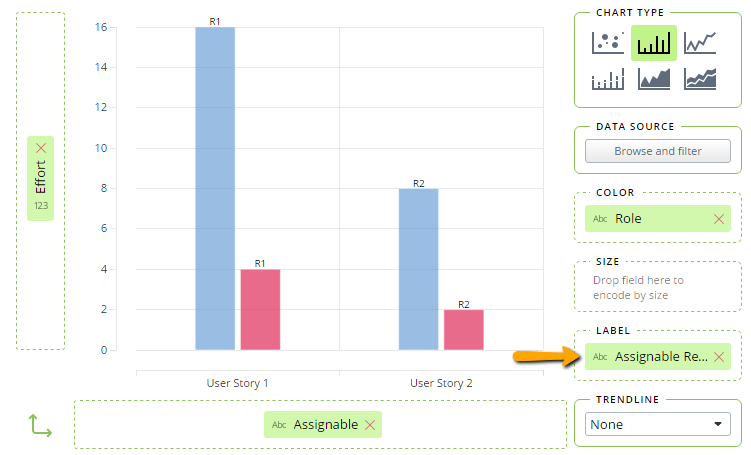 However, it is possible to create a report showing Role Effort distribution per User Story. The report can be exported. 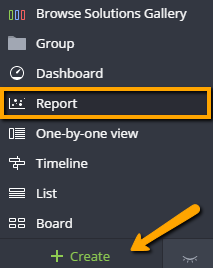 Create a new Visual Report based on Assigned Efforts data source. Put Assignable field to horizontal axis and Effort to vertical one. Put Role field to Color encoding selector. Select Bar as chart mode. Make sure that Effort and not SUM(Effort) formula is used for vertical axis. It helps to avoid duplication when your work items have multiple users assigned under the same role. As a result, the chart shows role effort per each user story. Roles are encoded by color. You can include more details into your report by Assigned Efforts. Label may serve this need: add the property you're interested in (such as Assigned User, Release, Sprint, Project etc.) into Label field to make it visible in the report and exported file. 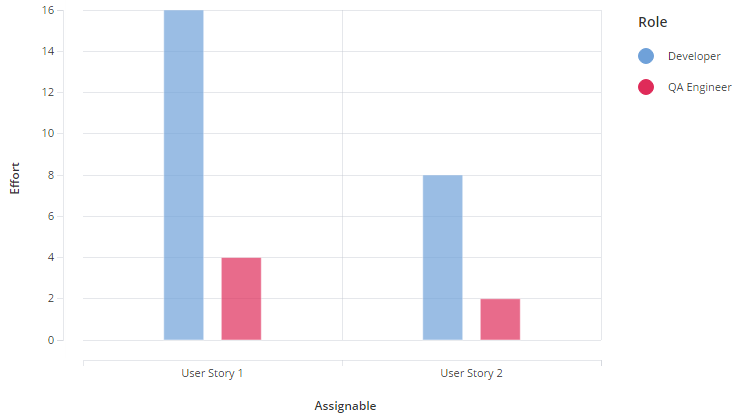 Let's distribute user stories from our dataset by two releases. And we'll put Assigned Release field into Label encoding. Every bar becomes annotated with name of Release a user story is assigned to. 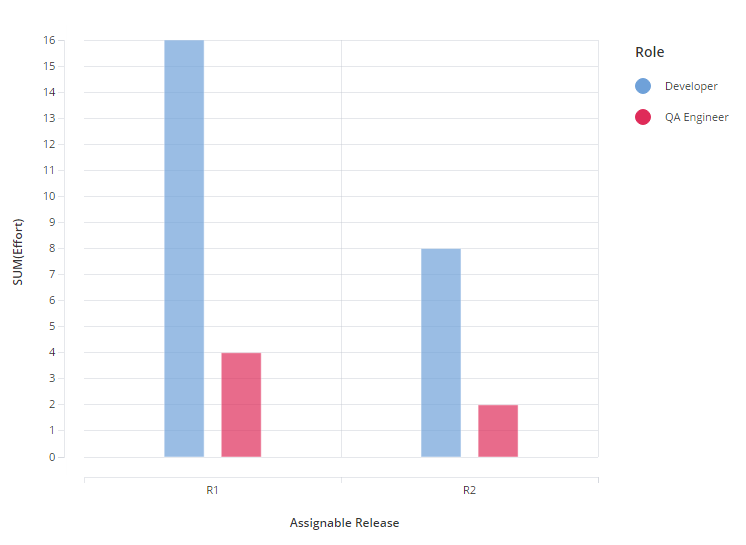 A report showing total Role Effort per Release or Iteration is also supported. 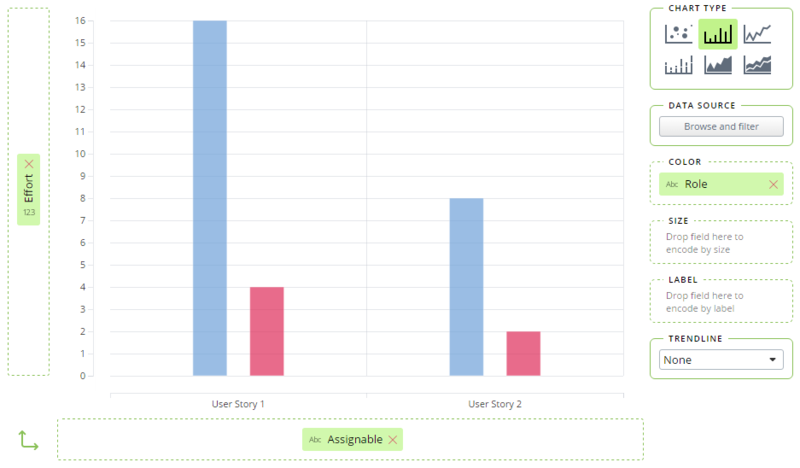 Let's distribute user stories from our dataset by two releases. We'll now build a report showing summary of Role Effort per Release. 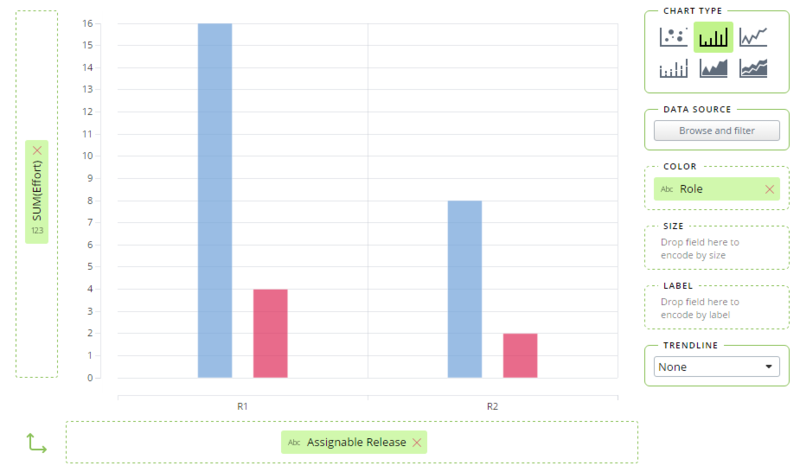 Put Assignable Release field to horizontal axis and SUM(Effort) to vertical one. Put Role field to Color encoding selector. Select Bar as chart mode. Other fields such as Assignable Project, Assignable Iteration, Assignable Team, Assignable Team Iteration are supported as well and can be used for grouping of your work items. As a result, the chart shows total role effort per each Release. Roles are encoded by color. This report may provide you with incorrect totals when multiple users are assigned to a work item under the same role. To make the report more accurate, split assignments as described in the article: Effort is duplicated in reports based on assignments.